Thirty-three residents of Grand Fond will soon benefit from Government’s national housing initiative. Grandfond joins several other communities around the island with new housing units expected to come on stream by June. 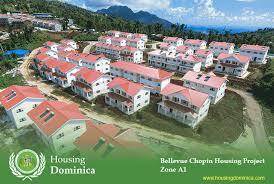 Prime Minister Roosevelt Skerrit says this is the first phase of a project that caters for 66 families. Mr. Skerrt boasted that the new homes are built resistant to weather events and will provide saety for residents during the hurricane season. Public Works Minister John Collin Mac Intyre said the new structures are in keeping with Government’s policy on building resilience. He cautioned that the housing initiative should not be taken for granted as the Dominica Labour Party-led Government has delivered on quality, climate resistant buildings in the aftermath of Hurricane Maria. He said the many housing projects ongoing around the island are not political gimmickry. Meantime, outgoing Parliamentary Representative for the neighbouring Laplaine constituency Petter Saint-Jean has commended the government’s efforts. Saint-Jean thanked the Prime Minister for responding in a timely manner to the housing needs of people in the South East.